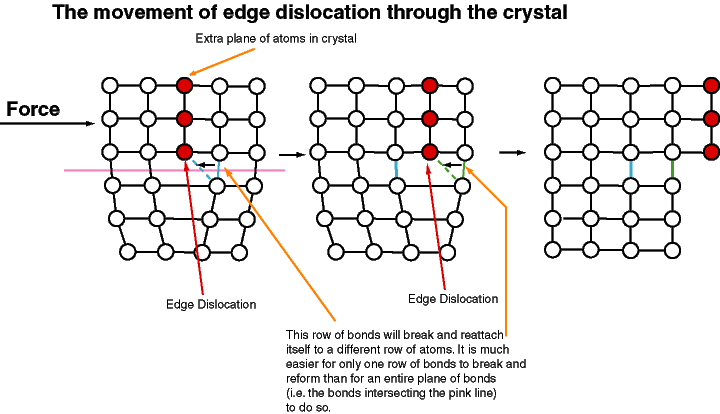 An edge dislocation may be described as an extra plane of atoms within a crystal structure. It is accompanied by zones of compression and of tension so that there is a net increase in energy along a dislocation. The displacement distance for atoms around the dislocation is called 'burger's vector'. This vector is at right angle to the edge dislocation. 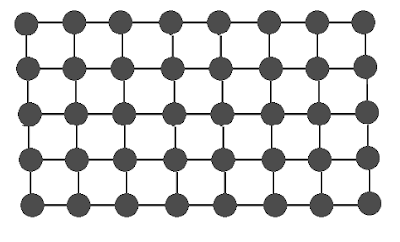 Whenever a half plane of atom is inserted between the planes of atoms in a perfect crystals then this defect is produced Fig a: Shows a cross section of a crystal where dots represent atoms arranged in an orderly manner. Fig b: Shows the displacement of atoms when an extra half plane is inserted from the top. It may be noted from this Fig that top and bottom of the crystal above and below the line X-Y appears perfect. If the extra half plane is inserted from top the defect so produced is represented by ┴ [inverted T] as shown in Fig. 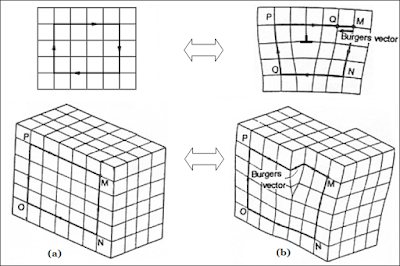 and if the extra half plane is inserted from the bottom, the defect so produced is represented by T.
The criterion of distortion is what is called the burgers vector. 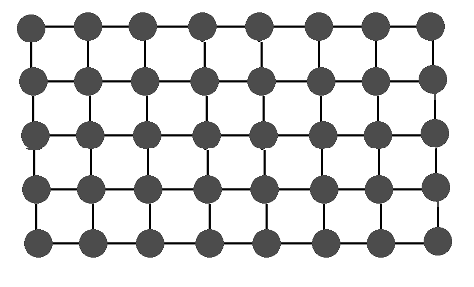 It can be determined if a closed contour is drawn around a zone in an ideal crystal by passing from one site to another as shown in Fig. (a) and then the procedure is repeated a zone in a real crystal containing a dislocation. As may be seen from Fig. (b), the contour described in real crystal turns out to be unclosed. 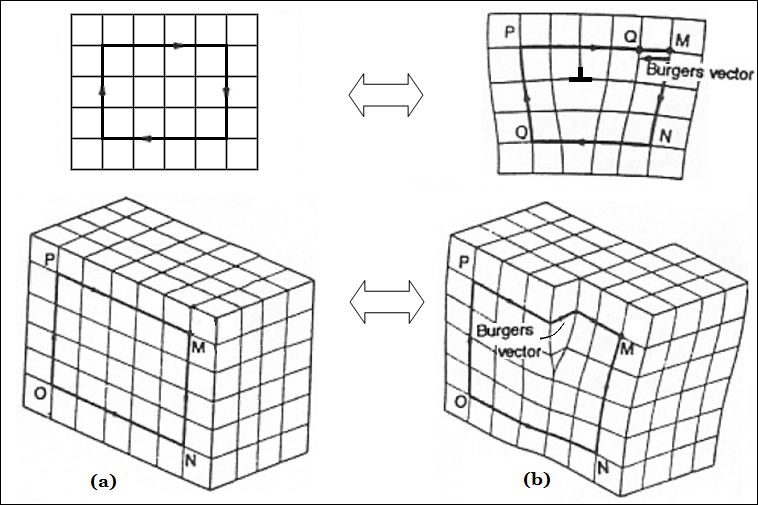 The vector required for the closing the contour is the Burgers vector. 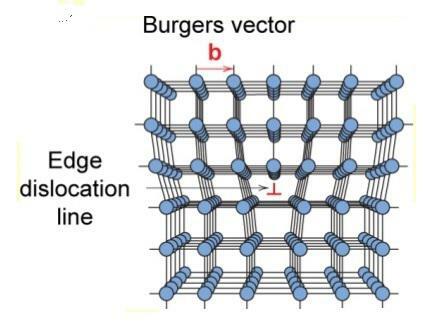 The Burger's vector of an edge dislocation is equal to the inter atomic space and perpendicular to the dislocation line.